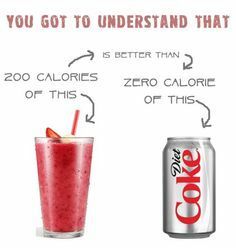 Calorie counting is something I believe is essential to succeed but it is important not sacrifice good healthy quality calorie containing food for processed rubbish that is zero calories. The same rule goes for junk food, you can’t live on junk food just because you stay within your calorie limit. If you eat more than what your body needs, the excess food may be stored as muscle but mostly it is stored as fat. First you must calculate your basal metabolic rate (BMR). Your BMR is how many calories your body burns a day just by simply being alive. To maintain your current weight you need to factor in your intensity of exercise ( if you work in kilojoules 1 calorie = 4.2 kilojoules). If you consume less calories than what you burn off you will lose fat, if you consume more you will gain fat. In saying that it is important to at least consume more than 1200 calories a day otherwise your body will go into starvation mode. Now that you know how many calories you can consume per day it is as important to calculate the macronutrients (macros) your body requires to achieve the goals you desire. Macronutrients are types of foods that are required in large amounts in order for your body to function properly, these are carbohydrates, protein and fats. 40-60% carbs, 25-35% protein, 15-25% fat. 30-50% carbs, 25-35% protein, 25-35% fat. 30-50% carbs, 40-50% protein, 30-40% fat. With your calories and macros it is also important to factor in your gender and body type (ectomorph, mesomorph or endomorph). I suggest experimenting with your macros, see what works for you. It is advised that your daily protein intake will be your weight in kg x 1.2 – 2 grams of protein, again this depends on the individual and the goals they wish to achieve. 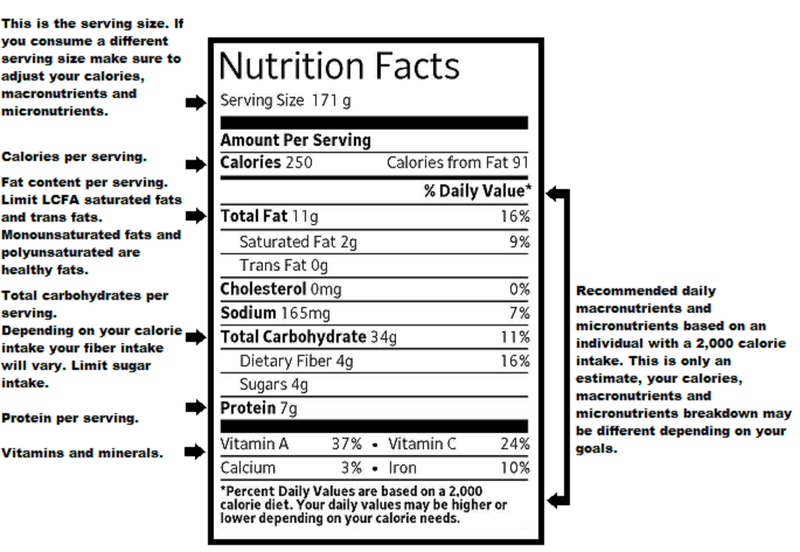 Get use to checking nutritional labels for everything you buy, below I’ve put an example of what a general nutritional label looks like. Also before purchasing anything make sure to read the ingredients, I remember one day I saw a breakfast cereal that was marketed as a chia seed cereal I was curious to see what percentage of chia seeds the whole box contained… it was 2%, within that whole box only 2% of it was chia seeds! This cereal was advertised as healthy because it contained chia seeds that was its main selling point, so what I am trying to instil in your mind is to not blindly believe what is promoted to you as ‘healthy’. Majority of the time in health foods there will be a lot of ingredients I don’t consider beneficial or healthy. If you are unfamiliar with some ingredients jump on your smart phone and research it or write it down and research it later this will help to familiarise yourself with things to stay away from in the future. Always remember not to sacrifice quality for quantity.